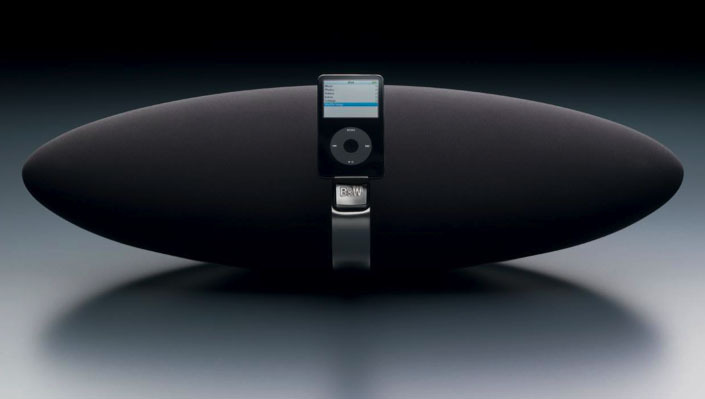 When an iPod speaker costs $600, it had better be taken very seriously by its designers. Luckily, the new Zeppelin has high-end British speaker manufacturer Bowers & Wilkins (B&W) as its loving parent. It looks like it flew right off the cover of Led Zep I, except that it’s not in flames. This 2.1-channel iPod speaker/dock sings with all the power of an opera diva — and just in time for the newest line of iPods. I’ve been using B&W speakers (currently the 685 series) in my home audio rig for many years, so I was understandably excited when the company came out with a high-end iPod speaker. After unboxing and setting it up, which took all of a minute or so, I was definitely not disappointed in the least. The Zeppelin’s gorgeous oblong polished stainless-steel body actually has a purpose: Putting less enclosure material around smaller speakers can help smooth out the frequency response by keeping the sound from pouring out of the midrange drivers and tweeters and bouncing off the speaker cabinet. A black cloth speaker grille covers the entire front and wraps part way around the back as well; unfortunately, B&W deliberately made it nearly impossible to remove, citing that the drivers are very delicate. The whole thing measures 25.2 inches wide by 8.2 inches deep. It’s 7.8 inches high, or 8.8 inches if you use the included rubber tilt pad. Without the pad, the speakers are angled upward for placement on a low table; you’d use the pad if you were putting the speaker at head height, like on a shelf or on top of your TV — a very thoughtful touch. It weighs a very beefy 16 pounds, which is about the same as Apple’s iPod Hi-Fi, though the Zeppelin is a lot more awkward to carry. The two 1-inch aluminum dome tweeters — the same Nautilus tube-loaded ones that are in the company’s downright unaffordable Reference 800 speakers — are at either end. Just inside those are a pair of 3.5-inch glass-fiber midrange cones, and there’s a 5-inch subwoofer in the center. The sub is driven with 50W from the speaker’s amp and hass two bass ports in the back, while each other driver gets 25W apiece. Those are pretty solid specs for an iPod speaker. The curved iPod dock sticking out of the front has a cool spring-loaded design, so it doesn’t require inserts or adapters to accommodate the different iPod (and iPhone) models, which pleases the environmentalist in me. You can even grasp the iPod comfortably in your hand while it’s in the dock. On the back, there’s an eighth-inch jack that does double duty as an analog line input and a TOSlink digital input. You also get a USB port, composite video output, and S-Video port. It’s a very thorough and space-efficient back-panel setup. The on-board controls are simple: a power button and volume buttons, with an LED that glows blue, red, amber, or green, depending on power state, input source, and play/pause mode. An egg-shaped infrared wireless remote gives you access to playback functions, power, and source selection, plus it feels good in your hand. When you plug in your iPod to the dock connector, an extra item called “Speakers” appears in the main menu. It doesn’t do a whole lot except give you access to a bass adjustment menu that goes from +1 to -3. You can also set when you want the iPod’s backlight on while it’s in the dock, and you can choose to have the player show full-screen album art (or not). The USB port on the back of the speaker isn’t just for pass-through syncing; the speaker can receive software updates so the company can modify how it communicates with future iPods. My listening tests reveal the Zeppelin to be an unusually capable one-piece speaker in terms of power and stereo width, though it does have its limitations. On modern rock tracks like “Rock the House” by Gorillaz and Tokyo Police Club’s “Your English Is Good”, the Zeppelin handles relatively deep bass and edgy drums very well in relation to the vocals. Plenty of impact, good overall balance, and fuzzed out bass doesn’t turn to mush. Quasi-psychedelic classics from the late 60’s and early 70’s like Led Zeppelin’s “Whole Lotta Love” and Gal Costa’s version of “Nao Identificado” benefit from a very wide stereo image for a single-cabinet speaker system. All the weird whirrs and panned freak-out effects come across very well, and the sweet spot where you can actually hear the panning properly is several feet wide. More refined tracks sound excellent, with plenty of clarity and exceptional balance in all registers. Maurice Andre’s trumpet sings over the orchestra on the Albinoni Trumpet Concerto in B flat, but without being overbearing. The same goes for Frank Sinatra’s voice cutting through Count Basie’s band on “Pennies from Heaven”. Even if the design weren’t outrageously hip, this would be a great speaker even at a hefty price of $600 (still not bad for a direct descendent of one of the best reference speakers series ever. But it just so happens that the design itself contributes to the excellent sound.